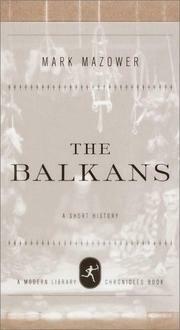 A skillful navigation of the stormy seas of Balkan history. In this brief but significant account, Mazower (Dark Continent, 1998) dispels a number of common misconceptions about one of the most misunderstood regions (and peoples) in the world. He maintains that violence is no more endemic to the Balkans than any other part of Europe, for example, and that for most of its history the area had “no ethnic conflict at all.” Of course, this begs the question: Why is it only in the last one or two centuries that the cocktail became politically volatile? The author begins with a discussion of the geography, noting that mountains “have made commerce within the region more expensive and complicated the process of political unification” and showing that even the rivers are not suitable for commerce or communication. He then begins his chronological narrative, arguing that the “basic ethnographic composition” of the Balkans dates to the seventh century a.d. While the major religions—Orthodoxy, Catholicism, and Islam—have always struggled for dominance in the region, they have also (in the remoter provinces, at least) tended to melt into one another, creating a hybrid system “densely populated by invisible spirits, both malicious and benign” (e.g., the vampires of Transylvania). During the 19th century, “nation building” was the prime concern; after WWI, however, regional rivalries were “sharpened and intensified by ideology.” Mazower adheres to the conventional belief that federalism “remained the communist strategy for handling [multiple] nationalities,” and that Tito’s death and the fall of communism caused the system to break down. He also maintains that the development of material prosperity is a prerequisite for the development of strong democratic traditions.